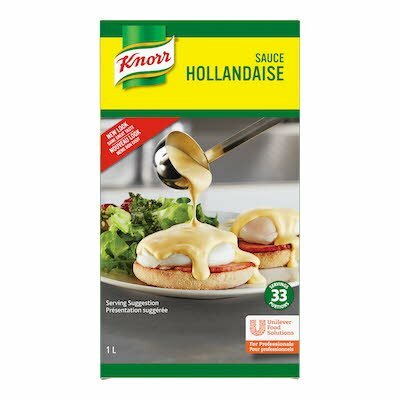 Repertoire Ready-to-Use Hollandaise sauce saves you valuable time and labour costs; just heat and serve. Repertoire makes it easy to serve gourmet sauces where you may never have thought possible! Heat and serve. The Sauce Hollandaise may also be heated in a microwave at high power but not in this foil-lined pack. Since Repertoire sauces will not separate and can be held warm for up to four hours and refrigerated up to three days after opening, they'll minimize waste and save you money. Repertoire makes it easy to serve gourmet sauces where you may never have thought possible! They're ideal for banquets and catering but whatever the occasion, their quality will have customers believing you made them from scratch. For innovative snack ideas, toast Thomas' English Muffins and top with any of the following: tuna, salmon, ham, asparagus, etc., then coat with Hollandaise Sauce, made as per recipe. Put in the oven at 350 degress F until hot and starting to turn golden brown. Serve immediately.